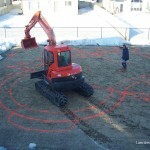 This backyard was a blank slate, the swimming pool, the stone surround and the landscaping were completed first. 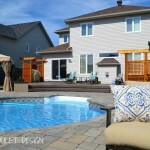 The second phase included the waterfall, hot tub and corner shed, to make this backyard feel like a resort without the commute. 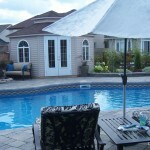 The last phase included the addition of a gazebo patio and a low deck leading from the home to the pool area. A few photos of the backyard showcase the seating area which surrounds a gas firepit for cozy warmth on a cool summer evening. 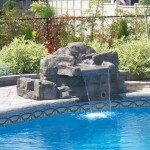 The addition of the waterfall helps to soften any surrounding noise and lends some tranquility to the space. 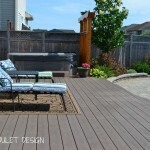 The deck completes the backyard transformation that was started four years ago. It is made of composite wood as it curves easier than cedar would have. Three screens were added, one in front of the hot tub, one at side of the house to hide the pool equipment and one surrounds the BBQ area. A stone patio was also added to the left of the deck for dining under the gazebo.